I'm a little squeamish when it comes to blood and I hate hospitals, but how many people can say they've discovered remains with a real-life forensic anthropologist? Okay, so maybe it was a dead bird we found in the wall while remodeling my friend's kitchen. 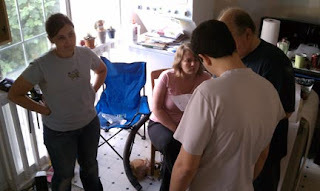 Her mom really is a forensic anthropologist, and I helped her clean up the mess. 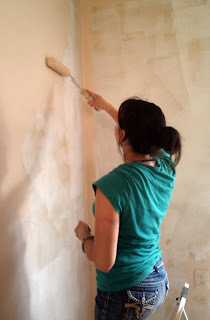 She then let me patch the wall. 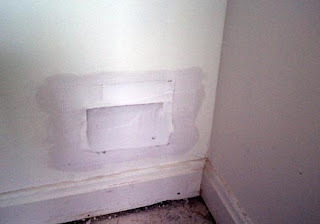 While Ty Pennington won't be asking me to help on Extreme Makeover: Home Edition any time soon, this is where the washer/dryer is going, so it was a good spot to perform my first spackling job. However, I can rock a paint roller. My new friend McKenzie and I primed and painted the living room while the pros got to work hanging cabinets. Did I say pros? I meant brave souls. And what would a holiday weekend be without a baking adventure. 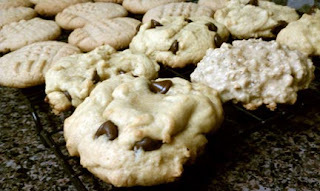 I tried three new cookie recipes: peanut butter (I know, I've never made peanut butter cookies before), pudding chocolate chip and oatmeal applesauce. They looked really good. They also tasted good enough for me to give them to a few friends. In fact, they tasted good enough that I ate far too many of them to admit. I apologize to all my GoodReads friends who opened up their emails to find 500 updates from me this weekend, but I promise it was for a good cause. I now have a record of all the books that I own, including edition and genre. 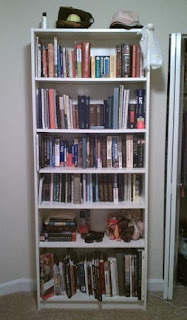 My nonfiction shelves are still a little disorganized, but at least I know what's there now. 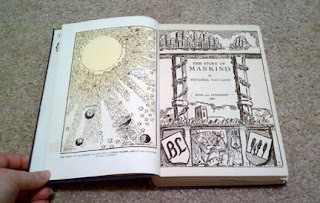 I had a little bit of a surprise when I discovered I had a first-edition copy of the first Newbery Award book, The Story of Mankind by Hendrik van Loon. While I hate the thought of a book not being regularly read, I might not be letting any more kids barrow this book. I still can't believe that I've read a first-edition copy of this book let alone that I own one for myself.